No one can visit Vienna without experience a Viennese coffee house, a typical institution that has shaped Viennese culture. In fact, as of 2011, the coffee house culture of Vienna has been listed as ‘Intangible Cultural Heritage’ by UNESCO. Your typical coffee house in Vienna will offer a large selection of coffees, international newspapers and delicious pastries or desserts. In some, there will even be live music in the evening, and various social events such as literary readings. In the summer, many of the cafes spill out onto the streets into a Schanigarten. In Vienna, it is completely normal for someone to sit alone for many hours in a coffee shop, whether they are working, reading newspapers or simply people-watching. Milchkaffee: A latte. Large coffee with frothed milk. Einspänner: Strong, black coffee, typically served with a little whipped cream. Verlängerter: Weaker, but larger version of the Groβer brauner, served with milk. Schwarzer or Mokka: Strong, black coffee, usually consumed with sugar, but served without. Kurzer of Espresso: A single shot of coffee. Eiskaffee: Cold coffee with ice cream, chocolate and whipped cream. 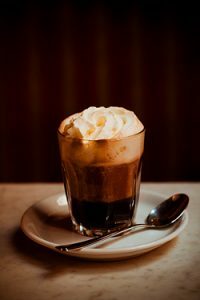 Cappuccino: NOT like an Italian cappuccino, but a regional variation made with whipped cream rather than frothed milk. Considering the coffee consumption in Austria is one of the highest in the world, more so even than Italy, no trip to Vienna is complete without a trip to a coffee house.